Automatica’s exhibitors were trumpeting Industry 4.0. Is this the turning point for robotics? 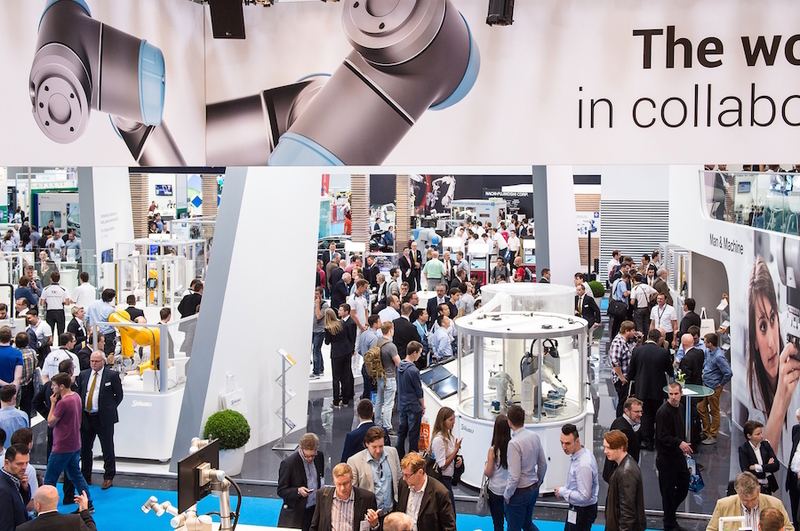 Industry 4.0 – the fourth industrial revolution – was the main theme at the largest robot and automation fair in the world, Germany’s AUTOMATICA, which took place in Munich throughout the last week of June. But what exactly is Industry 4.0 and how do developers and manufacturers big and small believe it will revolutionise production? The signs and banners were everywhere throughout the gigantic conference arena: “The heart of Industry 4.0”, “Welcome to the 4th industrial revolution” and “Hello Industry 4.0, we go digital!”, trumpeted by leading German robotics supplier, KUKA. SMErobotics, the European Robotics initiative for strengthening the competitiveness of SMEs in manufacturing was also showcasing results from their 4.5-year project. 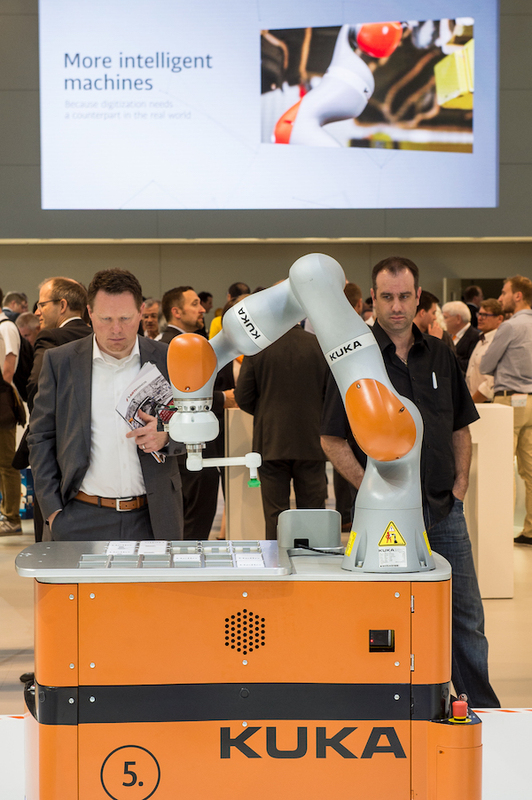 The coming changes are set to result in a host of new opportunities, say Industry 4.0 enthusiasts such as KUKA, which enticed the public onto its exhibition space with the showstopping Paulii Brothers – a pair of LBR robots perfecting, jointly, the fine art of pouring a German wheat beer. But the company’s massive orange-hued demonstration area also featured a smaller exhibit, a screen showing every one of the dozens of networked KUKA robots at AUTOMATICA, with the possibility of pulling down data on rate of operation, speed and more. “KUKA is not just about robots,” Wolfgang Meisen, the company’s Head of Communications, pointed out. “It’s also an application provider and systems provider, with full automation assistance. The robot is one of the key elements. Experts believe that within two years the first wave of factories using smart technology will be fully operational, with widespread adoption throughout the world in the next decade. So the big manufacturers were out in force at AUTOMATICA, gearing up for what they see as the a major push for their products. With an appearance by German goalie Jens Lehmann on its stand, clamping and gripping systems manufacturer Schunk, was clearly hoping for an additional push. But when in comes to Industry 4.0, the company believes the goal is “connectivity.” General Manager, Tomas Berg demonstrated this by comparing parallel exhibits. On the left, a scissor equipped pneumatic gripper and, on the right, a sensor studded version with all the corresponding connectivity on offer, such as putting output data on screen to inspect rate and speed and to highlight any broken links in the production line. The key attraction, said Mr Berg, is the ability to deliver more productivity through the flexibility of being easily able to change production lines. Thus removing the need for multiple lines of production. Collaborative robots, he maintains, make it so much easier to quickly and simply push though the development of products and deliver that flexibility. Universal’s strategy continues to rest on the enabling power of collaborative robotics which, they stress, offer the lowest return on investment, with no need for extra software or safety glass; the robot is used with ultimate simplicity, as a tool. Some were disappointed that Universal, arguably the stars of Automatica two years ago, were not launching any new products. Their range still consists of the UR robot in three different sizes, with a focus on selling out of the box. Instead, the Danish company is expanding the service it offers customers and developers with the free-to-use Universal Robots Academy, an e-learning facility, as well as Universal Robots Plus. Mr. Pollster described this as a robotics version of the App store, opening up the company’s products to developers. Universal’s success is indicative of a trend toward smaller and lighter robots for pick-and-place applications, small-part assembly, machine tending, material handling and logistics. And where two years ago the Messe Munchen arena was packed with caged robots, their liberated successors were out in force in 2016, inspecting parts and lifting cars but also making coffee and pouring beer. In fact, the biggest launch at the fair was by Italian manufacturer Comau, which was showcasing the world’s first high payload collaborative robot, capable of lifting 110 kilograms. 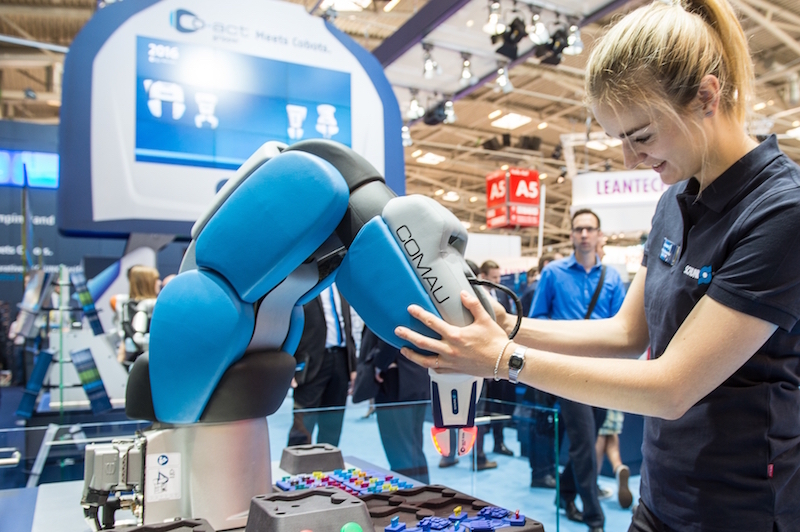 The success of the collaborative formula is demonstrated by figures from the German automotive industry, unveiled at AUTOMATICA: the number of robots rose by 17% between 2010 and 2015, while the number of employees increased by 13%. Evidence that man can co-exist very effectively with machine, providing employment for both. The belief at AUTOMATICA is that the potential of collaborative robots is so huge that we’re now just scratching the surface. Key to enabling the delivery of real time contextual knowledge to the enterprise, they pave the way toward hybrid factories with humans, robots and cobots – the future of manufacturing and Industry 4.0. But if people think robots will replace them, persuading them to accept robotic solutions is one of the challenges for Industry 4.0, believes Maxime Banon, Business Analyst with Spanish startup PAL Robotics. Several of the company’s award winning robots were in attendance at AUTOMATICA, including TIAGo, a flexible, configurable robot to assist people in repetitive, dangerous or annoying tasks, including light industry. Altogether, German manufacturers have pledged €40bn a year to help support new smart factory initiatives, and €200m of state funds has been earmarked for specific areas like human-to-machine interaction and cyber physical production systems within Industry 4.0. With manufacturing contributing 22 percent to Germany economy, their interest in Industry 4.0 is understandable. But worldwide, the phrase is a relatively unfamiliar one. Six in 10 UK manufacturing managers have never even heard of Industry 4.0 according to a recent poll. Additional videos and materials are available on the AUTOMATICA website.